Great article. However, the text implies that both CHAdeMO and CCS deliver the full 350kW power. However, the rating label for the dispenser clearly says the CHAdeMO is limited to 62.5kW (500V 125A). This is not at all surprising since cable and connector solutions rated higher than this are just starting to be commercialized. 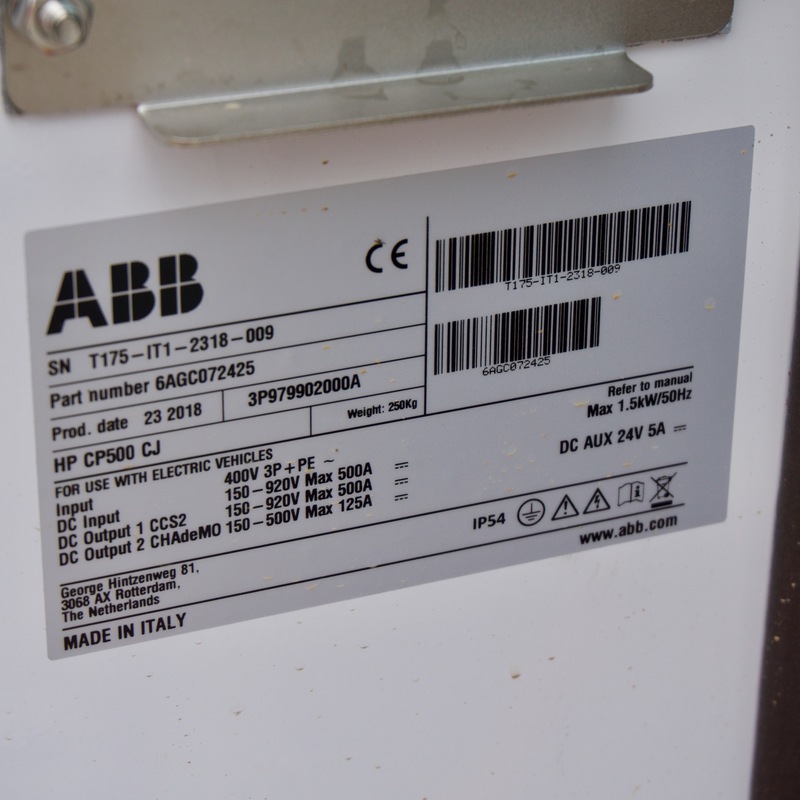 When 200A cables are available, it should be easy to upgrade to 100kW. Then later, when cooled CHAdeMO cables are available, a further upgrade to 350kW should be possible. However, it depends on whether ABB designed the system to eventually support two cooled cables or just one. It is probably supported because Electrify America is installing dispensers with two CCS cables. I notice the Veefils are RACV branded! The Labor Government is continuing the rollout with $2 million to support charging stations in Melbourne, Ballarat, Horsham, Torquay and Traralgon, boosting tourism opportunities for these regions. It seems they are mirroring what Tesla has already done! Finally someone is looking north of Perth for a fast charger. Which makes sense! Audi, Jaguar etc. are supporting this network and they can't use superchargers, but are going to want to travel the same routes. It would've been nice if they staggered locations - e.g. used Seymour, Wangaratta, etc. on the Hume route - but for various reasons they chose not to. I guess it's for the same reason as you always see McDonalds and Hungry Jacks at the same intersections! Staggered would have been nice if the Model 3 is getting CCS. Yes, this is the problem with EVs on long distance trips though. Yes, it only takes 40-60 minutes to charge whilst you rest and eat. However, unlike a fossil car, you are forced to eat and rest at the same locations all the time. In an ICE car, you can fuel up in about 5-10 minutes tops, then eat and stop wherever you like. I know we are just starting this EV rollout, but even If there was a DC fast charger in every town, I can't eat at that particular nice café 8 minutes drive out of town (or stop for a picnic at that little mountain lookout) unless I sit in the car for 40-60 minutes somewhere else before hand. I love EV's but its pointless to pretend that this is not somewhat of an issue that is not easy to solve. EV's truly have the everyday usage stitched up, its BETTER than the ICE car (provided you can charge at home), but not on road trips unless you are just happy to eat anything. Try a drive through California and experience the future. Is the food in country Victoria that bad these days? Haha, lots of good stuff, just not near DCFC. Yes, it only takes 40-60 minutes to charge whilst you rest and eat. However, unlike a fossil car, you are forced to eat and rest at the same locations all the time. Much less of an issue in a model 3 because km/h charge rate is considerably higher due to the efficiency. You can have a shorter DC charge while you use an amenity then move on to your cafe of choice. In no time at all we'll see level 2 AC charging appearing at these smaller business to attract custom as well. It's definitely a valid concern but it's also pretty easily addressed with cars in volume. Chargefox is talking about all 21 stations being done by the end of 2019, which will be impressive if they can more or less match Tesla's coverage by then! Chargefox have been busy on social media over the last week, and today announced their next two stations are Brisbane and Torquay! And I've requested for a mod to change the threat title to reflect that it's a national network now.